This edition: Prego Traditional Pasta Sauce, which is made from 11 separate ingredients that we’ve broken down in the exact order they appear online. 1) Tomato Puree (Water, Tomato Paste): This provides a deep tomato flavor. 2) Diced Tomatoes in Tomato Juice: This provides some more tomato flavor and a chunky texture. 3) Sugar: This is the most problematic ingredient in this ready-made pasta sauce, since homemade sauces typically don’t contain this much (if any) added sugar. 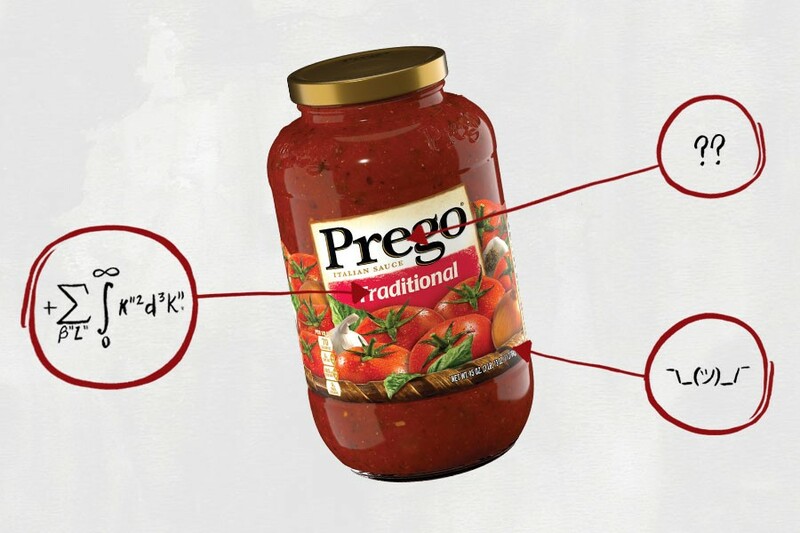 Prego Traditional Pasta Sauce contains nine grams of sugar — more than two sugar cubes — per half cup, which is their recommended serving size (HAHAHAHAHAHA). That’s 54 grams per your average 24-ounce jar, which is a considerable amount since, let’s be honest, most of us dump the whole jar into our pasta. The American Heart Association recommends that men consume no more than 36 grams and that women consume no more than 25 grams of added sugar per day. Too much sugar, if you didn’t already know, is terrible for you: A sugar-laden diet is associated with all kinds of ailments, from heart disease to depression. 4) Canola Oil: Physician and biochemist Cate Shanahan, author of Deep Nutrition: Why Your Genes Need Traditional Food, previously told us that consuming too much vegetable oil (canola, sunflower or corn) — which is easy to do, considering Shanahan says roughly 45 percent of the average American’s calories come from refined oils — has serious repercussions (i.e., fatty liver disease, insulin resistance and migraines). While it’s nearly impossible to eliminate vegetable oil from your diet altogether — major contributors include processed foods, fried foods, frozen pizzas, cakes, cookies, margarines and coffee creamers — it’s best consumed in moderation. 5) Salt: In addition to boasting tons of sugar, a single serving (again, just half a cup!) of this pasta sauce contains a whopping 21 percent of your daily recommended sodium intake. And like too much sugar, too much sodium is also terrible: It has been linked to high blood pressure, as well as increased risk for heart disease and kidney disease. Factor in that most of us eat several cups — or, again, just the entire jar — and that’s wayyy too much salt. 6) Dehydrated Onions: This are added for flavor. 8) Citric Acid: Citric acid is a sour flavoring agent derived from citrus and is often used to keep foods like ready-made pasta sauce fresh, even if they’ve been sitting on the shelf for months at a time. 9) Dehydrated Garlic: Yep, you guessed it, this is added for flavor. 10) Onion Extract: Once again, this is added for flavor. As an added benefit, studies have shown that the natural antioxidant quercetin, which is found in onion extract, may also improve the shelf life of foods. 11) Garlic Extract: And again, this is added for flavor. Welp, there go all of my excuses.